I’ve already gone on about the dodginess of John Key’s “faster rising incomes”, but the monetary policy part needs examination too. Now forgive me if I’m mistaken, but after the 4th Labour Government passed the Reserve Bank Act in 1989, government is no longer responsible for monetary policy. So John Key wants to take credit for Allan Bollard’s work. Nice. The pace of economic growth appears to have moderated. Corporate investment intentions are now below average. Household spending also remains weak, with household credit still flat and housing market slowing further….. The economy is going backwards, so the Reserve Bank is having to go outside its remit to try and save us from the consequences of a National Government. Reward: John Key taking credit for your work. Thanks. 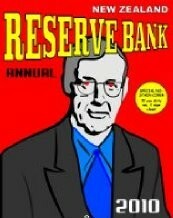 Out of interest the Reserve Bank does see some potential for growth in 2011. It’s almost entirely from overseas economies picking up – raising commodity prices and giving markets to our exporters. The only domestic growth driver is rebuilding Canterbury – so unless they want to take credit for the earthquake, they can’t claim to have done anything to help our ailing economy. Of course what John Key was trying to get at was Labour’s plan to reform monetary policy, trying to stop excess money flows making fortunes for currency traders but sapping our exporters and economy. He thinks that adding the equivalent of the Reserve Bank of Australia’s objectives (“stability of the currency; the maintenance of full employment; and the economic prosperity and welfare of Australians”) to controlling inflation would make for too complicated goals. Presumably the Australians are so much smarter than us and that’s why they can manage it. So lets try closing the gap with Australia – but without the long term goals that Australia is keeping an eye on. This will work well for NZ. Unless of course, Bill and John weren’t actually serious about closing the gap with Australia in the first place, and it was actually just another electioneering slogan to them. How exactly has Mr Key taken credit for New Zealand’s monetary policy. He obviously favours the policy so how else could he have made the statement you quoted. ‘We’ is New Zealand.i.e…. “New Zealand is combating rising prices through strong monetary policy …” Where is he claiming credit for creating that policy? The quote is from his opening of parliament speech outlining the government’s achievements and plans. The ‘We’ is most definitely ‘the National Government’ and not ‘New Zealand’ from its context. So this Government is working on two fronts to lower the cost of living for New Zealanders and their families. We are combating rising prices through strong monetary policy while also building a strong economy that can deliver faster rising incomes. I think Allan made a mistake raising the rate twice last year, and so close together. He should’ve paused on the first and only raised once at the second, to 2.75%. I think he made a similar mistake during 2007 when he ratcheted up the interest rate 4 times; should’ve only been 3, with a pause at the 3rd and raising on the 4th. I was thinking both these at the time they happened, but I guess I’ve been validated by hindsight. Interest rate rises are a blunt tool with which to control inflation. Especially when the rates the commercial banks charge seem to not reflect the rates of the Reserve Bank. But you know, officials and experts often have a bias for being seen to be doing something even if it turns out to be the wrong thing. Its an interesting psychological phenomena but you can see it in action around you all the time. The other tool that the Reserve Bank has always used to tamp down inflation is to encourage higher unemployment. At least in Australia, their Reserve Bank is forced to consider low unemployment as a goal right alongside their inflation target. The other thing raising the interest rate does, which was especially evident in 2007, is push the currency up. Exactly correct, all the international money speculators looking for the best overnight return on their $$$$$ park them here in NZD, forcing our dollar up. Ruinous for our real economy and our exporters as it makes all our products more expensive, but hey, its not like we need those decent paying manufacturing jobs anyway. Inflation must *average* 1-3% over the medium term, it’s allowed to leave the band (as it did when Labour was in office and it nearly hit 5%, despite the economy being in recession). national is supposed to be the party of business so where is the new business? Before all of those increases in the OCR in 2007, Bollard – concerned about how keeping the anti-inflation mandate by making such an icnrease in the OCR would impact on the value of the currency and harm the returns of exporters – asked for more tools he could use instead of simply raising the OCR. One was to place a surcharge on home mortgages (thus as the OCR would then not have to rise, business borrowing costs would not have to rise and exporters would get not have their returnes reduced), which was after all at least directly targeting one of the causes of inflationary pressure in the economy – the rising capital wealth of homeowners deriving from thr asset value bubble. One Bill English immediately killed the proposal by saying that the idea required courage and left unsaid the fact that he did not have any. PS I have advocated this policy for about a decade now (to Cullen) and add that a surcharge of 1% on home mortgages would raise nearly $2B pa. As to implementing such a policy, how about simply giving the RB Governor the power to time the introduction of the 1% surcharge as an alternative to raising the OCR from 3 to 4%. Thus it would be introduced .25% at a time. The alternative is a surcharge limited to rental property mortgages – but that could always be 2%. Shame Cullen didn’t take it up. Speaking of English, the last Labour Government was not nearly as courageous as it could’ve been either. How about giving the RB Governor the power to vary that surcharge between 0.25% and 2.5% as the RB sees fit. That way it becomes another real tool at the RB’s disposal. Plus a mandate to avoid future property asset bubbles before they really start going would also be helpful. Perhaps the ability to require commercial banks to only issue mortgages to those with a sufficient % deposit. I hope Cunliffe has seen your papers.